Bakwaas Trading: What was I doing? The thing that always happens with me repeated today. I had many reasons not to trade today. I was not able to focus today at all - I had some guests. And then, I went into some sort of revenge mode. Could have just avoided trading today. It was another 10 trade day for me. 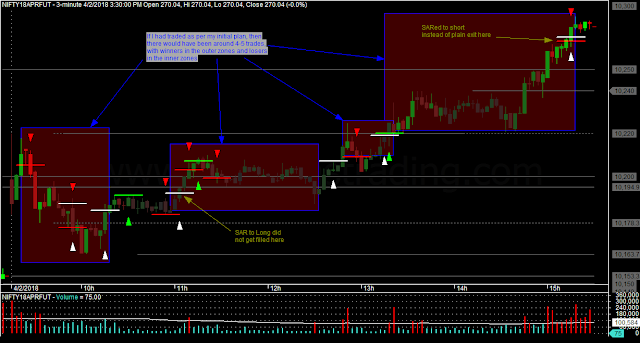 Ideally - like I marked on the chart - there should have been just 4 or 5 trades. No lessons learnt yet, but I am just thinking that in addition to lesson about trailing sooner, I should try to stay longer in the trade just as long as it does not look too stupid. Some very fine balancing needed here!! !